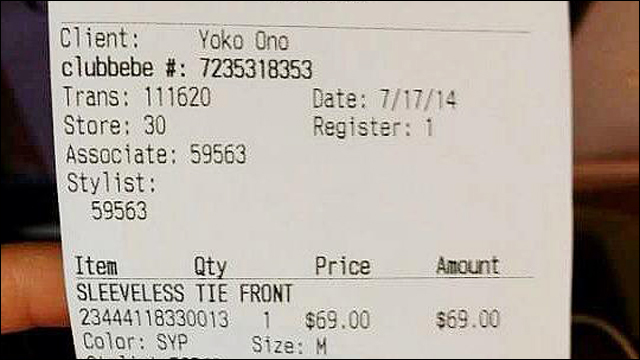 Clothing store receipt calls Asian customer "Yoko Ono"? Maybe not, but something shady is going on at bebe. 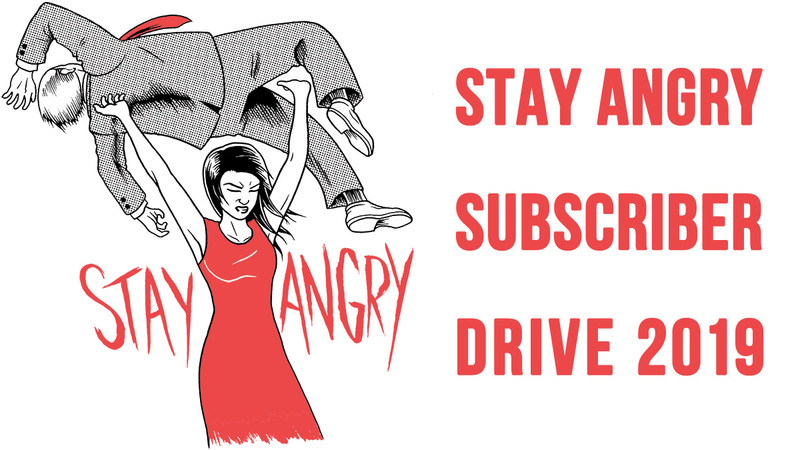 Got this passed along to me from a friend of a friend, who gives us our latest edition of Racial Receipts. 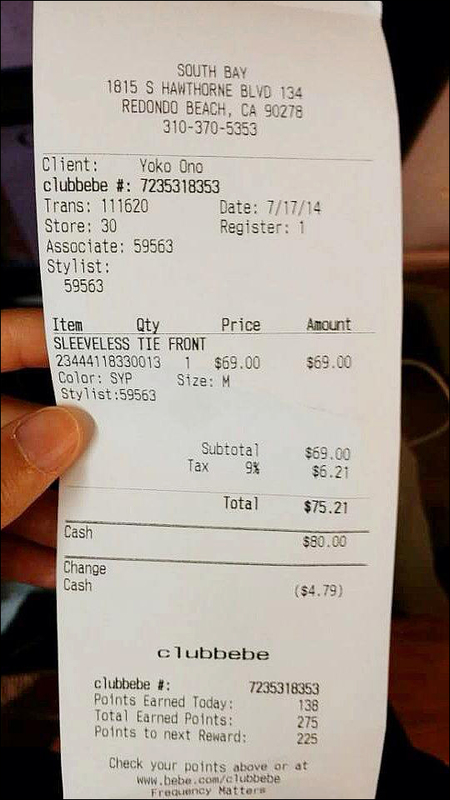 A recent shopper at the clothing chain bebe was handed this receipt after buying an item. As you can see, the customer, who is Asian American, is identified on the receipt as "Yoko Ono." This is not the customer's name. The transaction took place last week at the bebe location at South Bay Galleria in Redondo Beach, California. As you can see, the customer purchased a sleeveless tie-front top for $69.00 plus tax. She paid in cash. She apparently didn't even notice the name on the receipt until she got home. Some questions: why is there a need to put the "client" name on the receipt at all? 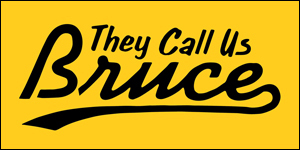 This is a clothing store -- not a restaurant like Papa John's or Chik Fil-A or Starbucks. And why is the customer referred to as "Yoko Ono"? Did the sales associate decide to get creative and bestow the customer with that name? The customer says she is not a member of clubbebe, the chain's loyalty program, which is detailed at the bottom of the receipt. The store's explanation: it's a mistake. The person registered with the clubbebe account listed is apparently named Yoko Ono. Seriously. According to a call with the store manager, Ms. Ono's account was accidentally associated with this particular purchase because the employee didn't exit out of the previous transaction. Okay, so the bebe employee did not just refer to the Asian American customer as "Yoko Ono." But... is it me, or does this still sound like something suspicious is going on here? At the very least, this so-called Yoko person just earned some clubbebe points on someone else's dime. Final question: does John Lennon's widow shop at the bebe in Redondo Beach? [EDIT] Yoko Ono is, of course, so much more than John Lennon's widow -- when I wrote that, it seemed like the quickest way to refer to the real-life person. That was a lazy mistake. 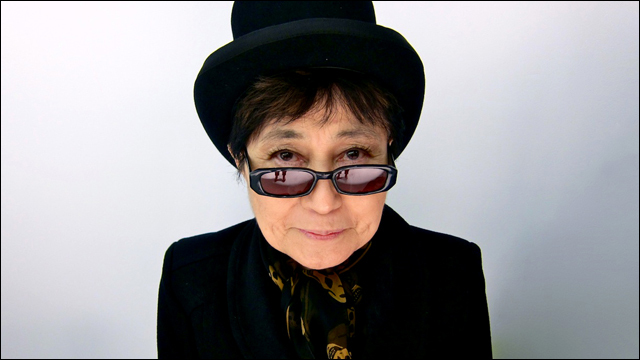 Yoko Ono is a world-renown artist, activist and musician... who may or may not shop at the South Bay Galleria.